Home Tags Posts tagged with "libertytraining"
I know you have asked many times about a blog like this, and the last couple of days I have had some spare time, so I finally wrote it for you! Who does not dream about having a horse who can lie down on a simple cue? It is the goal for many equestrians because it’s a trick that demands lots of training and preparation – and equal trust. 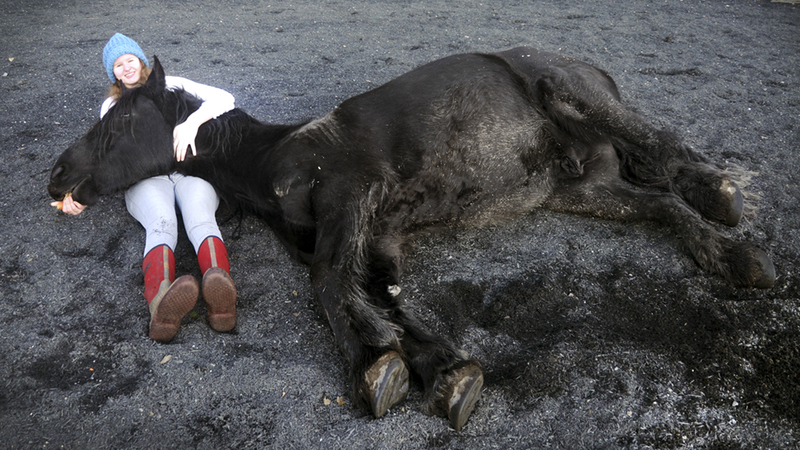 But do you need to be a professional trick trainer to teach your horse to lie down? Nope! 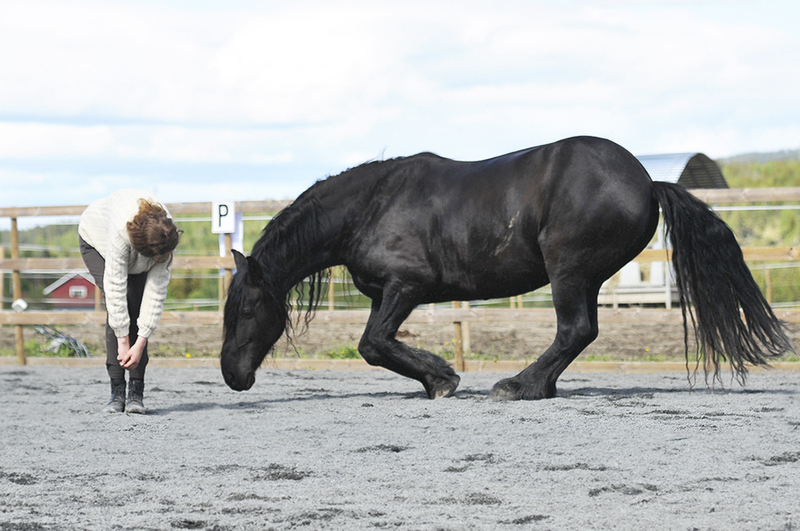 In this blog post I will down to the smallest details explain the steps of the process of teaching a horse to lie down on cue without ANY pressure, ropes or force. This is 100% positive reinforcement, and I prefer to do it this way because it keeps the horse comfortable, in control of its own body and that makes him feel safe. Training a horse to lie down this way demands patience, and although my way is not the most effective way, it is the most horse-friendly way. That’s what matters to me. I have used this method on several horses with great success, both introverts and extroverts. 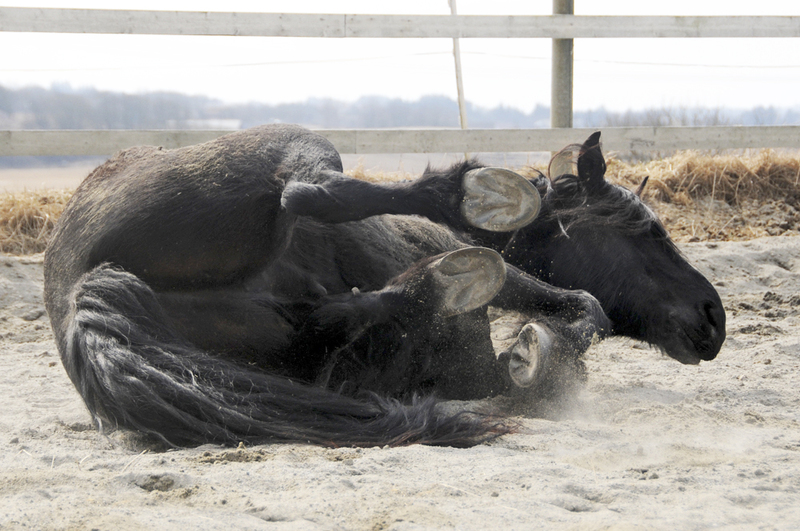 Rolling is natural behavior, and you can teach a horse to lie down on cue with rewarding natural behavior. This is the method Batman showed me, and the method I will explain to you. If you do have these tools, you can in the theory do anything. I have asked horses to lie down who have never had any experiences with trick training before, simply because they paid attention to my body language and was curious and interested. Batman sleeping. 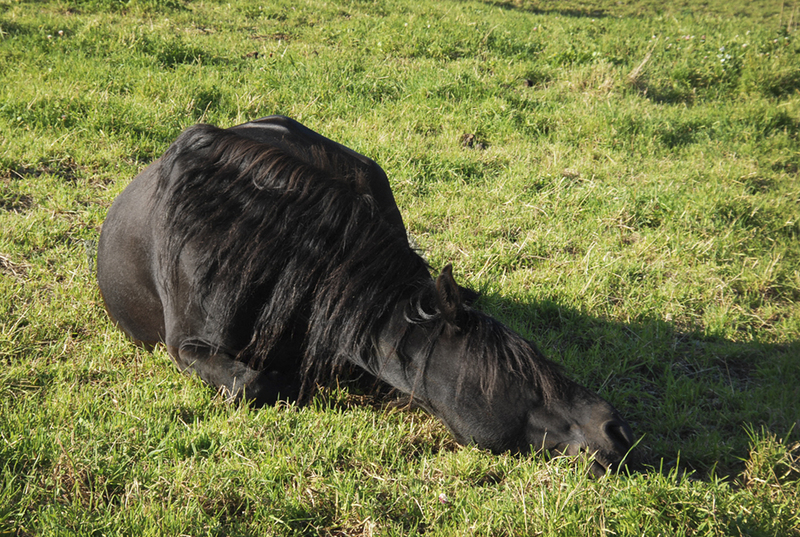 Horses only lie down when they feel safe and comfortable, and therefore it is smart to start the preparation with finding out where your horse is more likely to lie down. Pulling up the horse’s leg until it decides to give up and lie down is a kind of method that easily can break your horse down. (The typical “cowboy-method”) Horses lie down when forced with power if they are about to get killed and have given up their life. Some horses can handle being pushed by a human in a vulnerable position, but you will never know how the horse actually feels about it before you have put your horse in the situation already. Would you put your horse in that situation if you knew he would hate it? Nope. Horses need around two and a half hours of sleep a day. They usually sleep in short intervals. Get to know your horse, establish a good connection from the ground. Please read this blog psot about the topic. How much time do you spend together with your horse without riding? A good place to start is to simply remove the tack after riding, and walk around in the arena together to cool down. You can add some simple exercises as stop and walk again. Reward a lot. The bond between you two is the key to everything when it comes to trick training. If the horse is used to read your body language and get something informative out of you, it will be much easier to ask him to lie down. Be aware of your body language, and use body language instead of pulling the horse after you. If you do have a good bond and have done some liberty training from the ground already, it will be much easier to teach the trick. Your horse will need to use his brain to understand what you want, and the connection between you two is therefore, as I said, everything. If the horse is used to figure out what you want from the ground and then be rewarded for it, the horse will automatically be interested and curious if you are trying to ask him to lie down. A curious horse is easier to work with than a horse that usually never gets asked to do anything else than follow you from the paddock and to the stable and then back again! If you have done much liberty training or other training based on positive reinforcement, is well aware of the body language and know your horse’s behavior, this trick can be taught in less a day. The things that takes time, is to get the horse’s attention and make him curious. You have to be fun to hang out with to gain the horse’s valuable attention! A horse’s trust can never be forced, it must be deserved. When does your horse lie down? Is there a particular spot he likes to roll? Does he roll after a long hack? Does he like do relax in his paddock in the morning? Will he take a mud-bath after being washed? Does he roll when the rest of the herd rolls? Is he unsafe in general and you rarely see him roll or lie down? Ask yourself all of these questions, it’s a very important part of teaching this trick. When we are teaching a horse to lie down from natural behavior, we will make it much easier for ourselves when we do some research first. With Batman, I had noticed through the years that he loves to roll in the arena when I took his saddle off. That’s where I started with him. Spend time with your horse at liberty from the ground, and reward him for mirroring your movements. If the horse follows you in walk, reward. If the horse follows you into a halt, reward. If the horse starts running around if you are jumping around, reward. 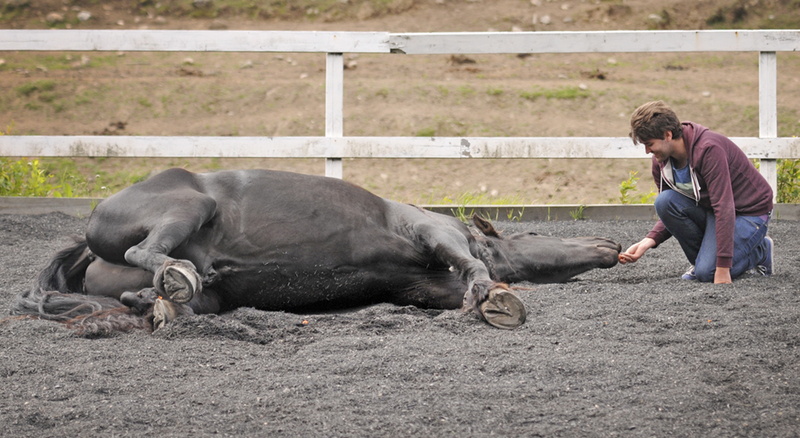 Find out in which situations your horse is most likely to lie down or roll on its own. Remember, the preparation is EVERYTHING. Batman relaxing with me as a pillow is a result of equal trust, training and playing from the ground and positive reinforcement. Batman is a horse with low confidence and is both introverted and insecure in general. 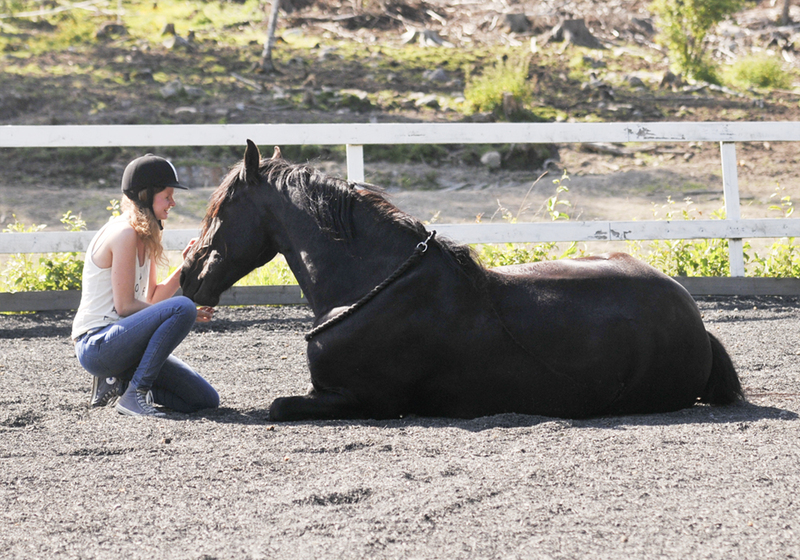 The second step in the process of teaching your horse to lie down on cue is to start trying. If your horse rarely rolls, you can approach him when he is lying down in the paddock and reward him a lot for staying in the lying position when you walks towards him. If you will try it through rolling, as is the more effective way, you can start trying that. Your horse might be a little sweaty after a dressage session, and the entire arena is empty. 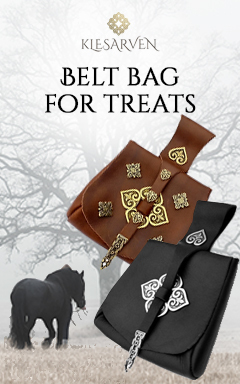 Go grab your treats and patience, remove all the tack, give your horse a rub on his favorite spot and walk around for some minutes together with your horse at liberty. Try to get him to mirror your movements and reward a lot. 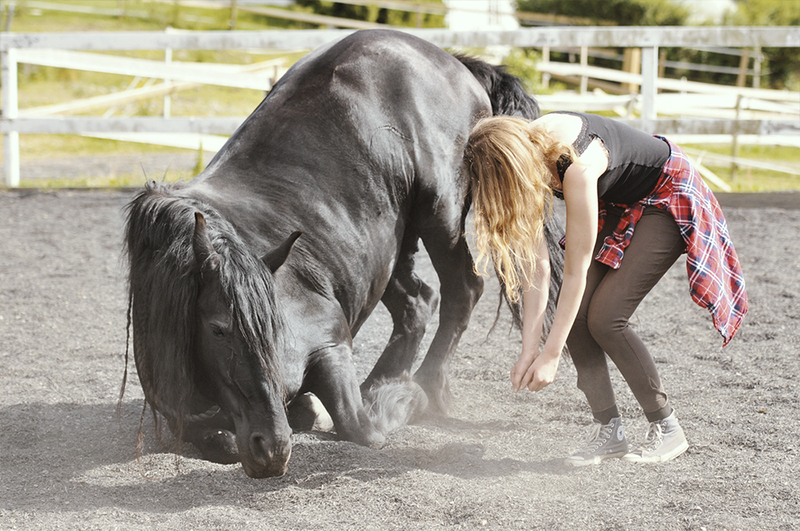 When you feel that the horse is connected to you, is paying attention to your body language and is curious for your next cue, you can start asking him to lie down. Batman mirroring me in a foreign arena. At home, I give him only a small voice cue. In strange places or outdoors, I use my body language much more. In herds, horses roll after each other in the same spot. This is natural behavior as well. Walk slowly, bend in your back and in your knees, look down in the sand, and if you know that your horse is making noises when he rolls, you can copy them as well. (Worked AMAZING on Bat) Keep on going, and use your foot to scratch a little in the sand. Walk in small circles. Pay attention to your horse, does he look interested? It’s very important that the horse understands that you are communicating with him, so keep an eye on him. If he walks in another direction, walk after and try to gain his attention again. Try to lie down or sit down yourself. Continue to make rolling horse noises, look at the ground and breathe. If your horse understood you quickly and does lie down or roll on the first attempt, praise a lot vocally. If you are nearby, try to walk slowly and carefully towards your horse (only if you know that your horse is comfortable with you). If you are allowed to go near the horse, give him A LOT of treats as fast as you can and continue to praise vocally. I used a plastic bag filled with carrots and apples at first, and made plastic bag-noises as a “treats are coming, you did good-noise” to praise him as soon as possible. Praise the horse like he just jumped a 2 meter fence with three perfect lead changes and a canter pirouette at the same time! 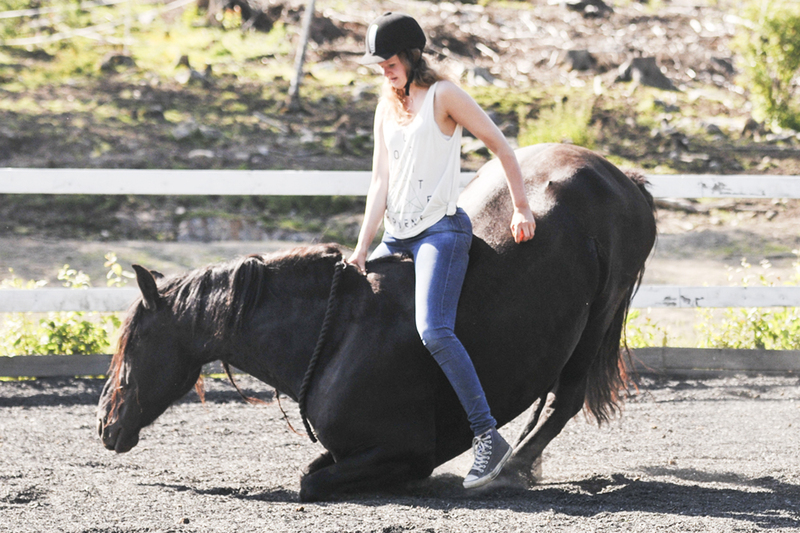 Then take a step back and let the horse continue rolling or get back up. Then you put a halter on and walks out of the arena. That’s it for today! If your horse is looking at the ground, walking in circles and looks like he is thinking about lying down, praise and walk out. Do NOT try for more than 15 minutes. The horse learns more from short sessions, and will spend the night thinking about today’s new experiences. You can try again tomorrow, using the same technique. To make this trick work, you must be very patient. I have spent hours and hours in the arena with Batman to get where we are today. Leaving the arena with pride and a good feeling is something you must get used to, even though you did not achieve “anything”. Because you always achieve something. You achieve wisdom, your bond will be stronger, and maybe your horse learned something. You must accept that the horse can choose to say no, I don’t wanna lie down today, but I understood your question. You can ask again gently, but you must know that there will be days the horse simply does not want to lie down, and that’s something you just have to live with. When we use positive reinforcement, we become very proud that the horse chooses to stay with us, play with us, do tricks together with us and pay attention. But we are always giving them the choice to walk away or say no, thank you. It is also important to let the horse find the perfect spot if he does not want to lie down where you are standing, but when you both are more experienced, you can use a halter and a 2 meter lead rope and start teaching the horse to lie down by your side. 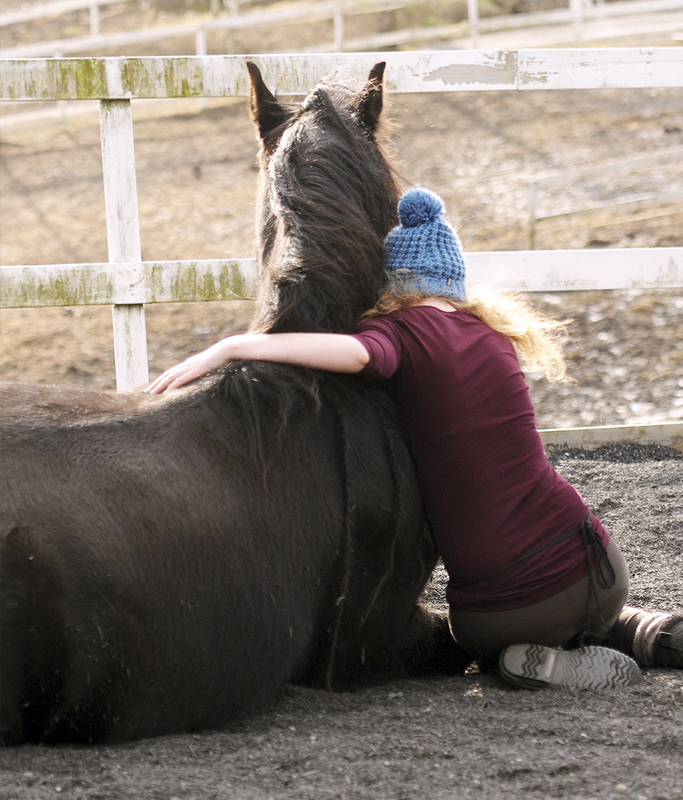 The horse can choose which particular spot around you, but stay by your side the entire time. When the horse is 100% comfortable with lying down, you can teach him to lie flat. I prefer to use a target, for example hold a carrot in front of the horse and let him reach for it. Move the carrot a bit for every time, until the horse stretch so much that he eventually lie down flat. I prefer not to touch the horse, allowing him to move his body freely and keeping his balance. 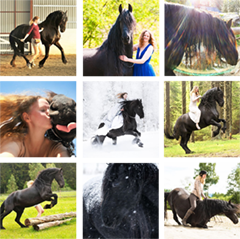 The horse feels most comfortable when he is in control of his own body. Take it from there, and soon you can just point with your finger to make him lie flat. Give him treats when he is lying flat as well, and ask him to stay a little longer every time. Eventually, your horse will lie down flat for a while. Remember that this is a very vulnerable position where the horse does not have much control, if he become insecure, he will get up in a second. Be aware of that and keep safe distance to the front legs. The horse can also start rolling, be careful and ALWAYS pay attention. My boyfriend Daniel trick training with Batman. Be always calm, give the horse space when he is lying down. I taught Batman to rest his head in my lap in 2014, but I do not recommend you to try this unless you are 100% sure about what you are doing. If somethings go wrong, the horse CAN roll over you, and you can be stuck under the head and neck. Especially with big horses, be careful! No trick is so impressive that it’s worth injuring your head for. Batman’s head weigh around 70-80 kg and he can easiliy crush my ribs by accident. This can actually be very dangerous, so please be careful. It looks cute and it is lovely, but it can be dangerous. I know Batman’s behavior extremely well after 6,5 years together, I would never have done this with other horses than him. When lying down the surface is also important; to some horses more than others. 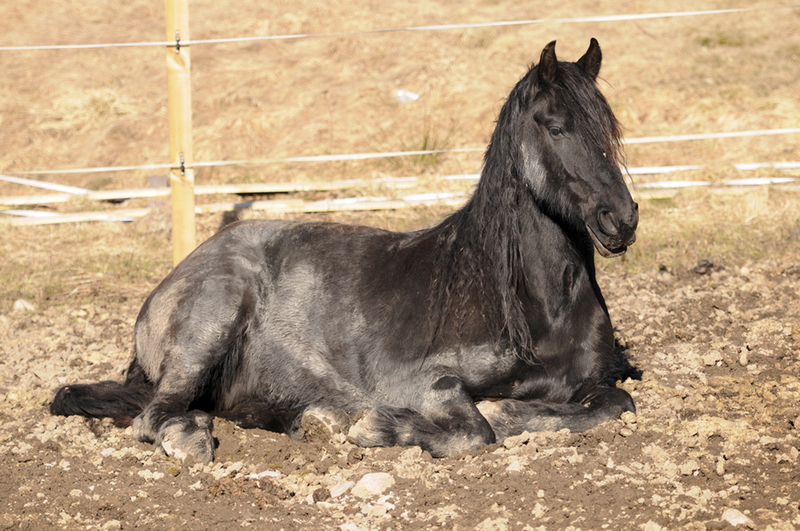 You cannot expect your horse to lie down on rocky gravel or wet mud. 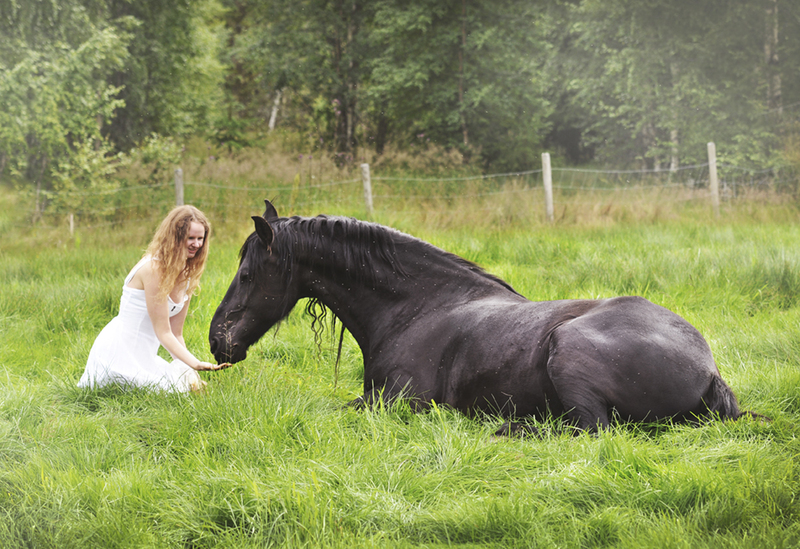 After some months of training you can ask your horse to lie down in a field or in the paddock or pasture, in the forest or other places with soft surface. Batman is very picky when it comes to surface, he has a heavy body and if I ask him to lie down on a hard surface it can be uncomfortable or painful. We do not want that! I asked Batman to lie down in the snow, but there was loads of ice below the snow that I did not notice. Batman understood my cue, and got halfway down, and then back again. He got LOADS of praise for this. He took my cue, but he chooses to get back up again because of the ice. This is VERY important. 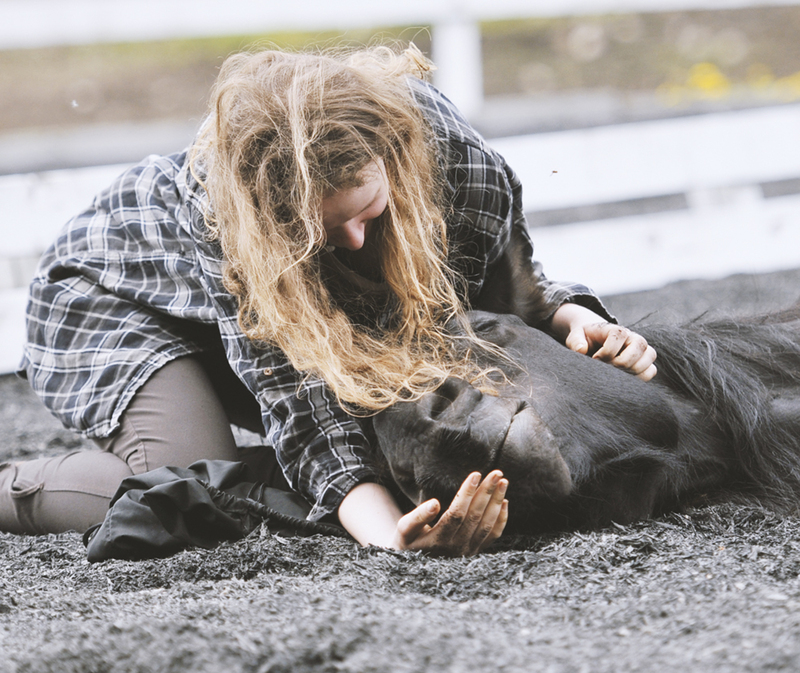 When you are around a horse which is lying down, the horse is in a very vulnerable position. Be ALWAYS prepared for that the horse any minute can get up, and a horse can get back up again fast. When sitting down beside a horse who is lying down, do NOT sit right in front of him. 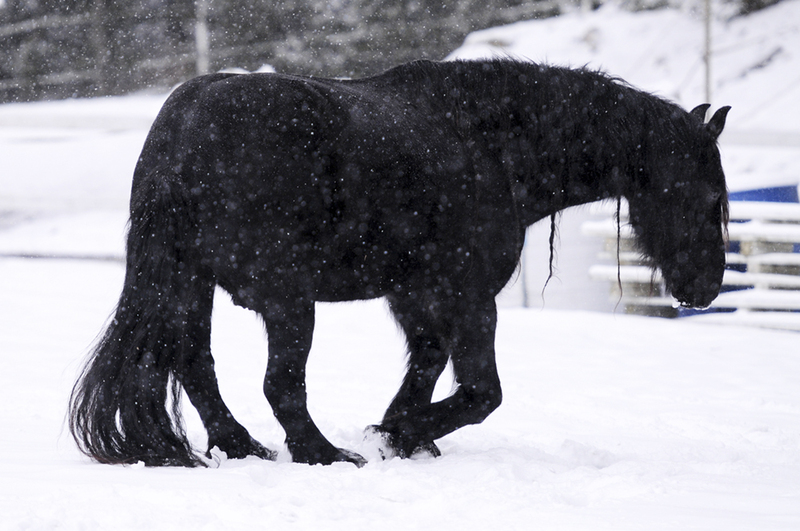 When a horse gets back up, he places his front legs straight forward, and then into a sitting position. You can be seriously injured if the horse hits you with his front legs and hooves. Batman getting back up, in the photo, in a sitting position. If I had sat in front of him here, he would have hit me with his front hooves. You can transfer the trick from the ground to under saddle. I recommend you starting from the ground, and when you both know the trick very well, you can try from the ground. I added a vocal cue when I taught Batman from the ground, and I use the same cue when I ask him to lie down from the back. I also relax in my entire body, breathe and give him the time he needs. Sometimes he drops down in 10 seconds, other times he need some time to think. How the horse reacts do the cue depends on the horse’s personality. Some horses are more eager than others, Batman is as mentioned earlier, both introverted and pretty shy. To me, everything is about get him to feel confident. I recommend to start without a saddle, just in case of rolling. When the horse hits the ground, jump off on the side the legs not are, sit down and praise. Later you can be sitting and give the treats from the horse’s back. Like teaching the horse to lie down from the ground, it is smart to try it while mounted a place the horse is used to lie down from before. 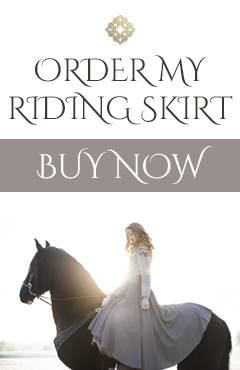 You can use the trick to get on the horse easily as well, without stirrups. Be calm and patient, praise a lot and give the horse time. When the horse gets up, hold on! It can be a pretty rough movement and horses can be slippery. A few months after reading this blog, you hopefully have a horse that can lie down when you ask! It is a very fun trick and the perfect way to end a session, to simply relax together or for a photoshoot! Good luck with the training, and remember: patience is the key. 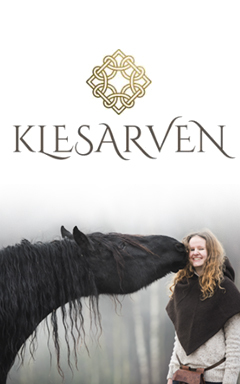 If you have questions about using treats in horse training, or positive reinforcement in general, please read Fairyhorsemanships articles here. I hope you enjoyed my blog post – if you have any questions, please ask below. Feel free to share with your friends in social media!